2018 has seen record heat waves on four continents, wildfires in the Arctic Circle and perilous water shortages in South Africa, Australia and India. There’s no question that human activity is responsible. Despite 195 countries signing up to the Paris Agreement to reduce carbon emissions in 2015, our use of resources continues to exceed planetary boundaries. Put simply, we are consuming more than we have. This year, Earth Overshoot Day, which marks the point at which we have used more from nature than the planet can renew, came earlier than ever before, on August 1. This is not just a threat to nature, but to human society too. To borrow a phrase: time’s up. Sustainability as we know it is dead. Doing less harm is no longer enough. The future of sustainability lies in regeneration: seeking to restore and replenish what we have lost, to build economies and communities that thrive, and that allow the planet to thrive too. For John Elkington, an authority on sustainable development who coined the term triple bottom line, the goal of sustainability will be to “regenerate economies, societies and the biosphere.” This is no small challenge. To tackle it, we’ll need to collaborate on a global scale to rethink systems, to reimagine production, to re-evaluate the way we do business and to reconsider how we live. Consumers are already operating from a sustainability mindset, even if they struggle to make it a lifestyle. They are increasing the pressure on brands to make it easier for them to do so, calling for greater transparency and pushing for more sustainable options. Witness this year’s grassroots plastic’s protests at supermarket checkouts the world over. As governments struggle to keep the fragile Paris Agreement on track, businesses and brands have an opportunity to play a decisive role in the sustainable future, putting regeneration at the heart of strategy. Yet what was perhaps once seen as a burden or a box-ticking exercise is now a major opportunity for innovation and even revenue. According to conservative estimates, a new sustainable economy centered on the United Nations’ Sustainable Development Goals could be worth $12 trillion and create 380 million jobs. It’s potentially a win on many fronts for brands, which can drive efficiency and minimize exposure to risk while aligning with the values of stakeholders from employees to customers. And companies such as Unilever are showing that it’s possible to make a profit too. 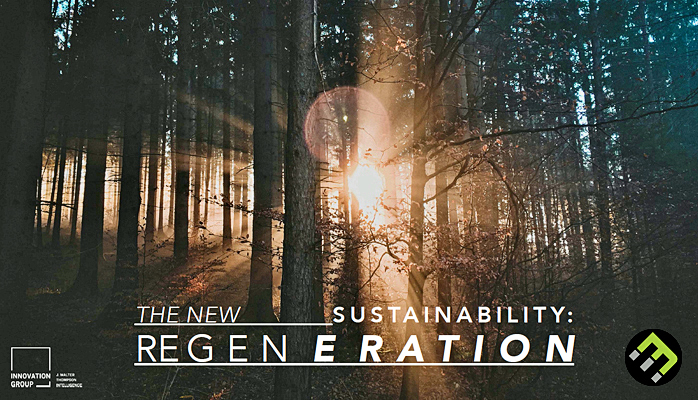 For more, see JWT’s report “The new sustainability – regeneration“.